In 2011 and 2012, Protection Engineering Consultants performed tests and analysis to evaluate the performance of high strength glass with standard commercial window systems in blast overload situations. The research and development program was sponsored by the Defense Acquisition Challenge (DAC) program; an initiative of the Office of the Secretary of Defense (OSD) Comparative Technology Office. The project was contracted through and supported by the Air Force Civil Engineering Support Agency (AFCESA) and the Air Force Research Laboratory (AFRL) at Tyndall Air Force Base. The Defense Acquisition Challenge (DAC) Program provides opportunities for both innovators and the Department of Defense (DOD). For innovators, it means faster entry to the defense acquisition system. For the DOD Program Manager (PM), it means increased technology insertions to improve systems. PEC’s project was awarded to expedite the innovation of better glass technologies for the protection of DOD personnel worldwide. Specifically, full-scale static and dynamic tests were performed on Herculite® XP glass developed, manufactured and incorporated into glazed windows by PPG Industries, and commercial mullion systems developed, provided and installed by Physical Security, LLC. Herculite® XP is a high-strength glass technology with a residual stress about twice that of commercially produced fully tempered (FT) glass. The research program included quasi-static tests of Herculite® XP glass at our Austin office, shock tube tests of punched windows at ABS Consulting (ABS), and two full-scale blast tests at AFRL on insulating glass units (IGUs) in punched window and storefront configurations using commercially available window frames. The main goals of the research program were to evaluate the performance of window systems composed of high strength glass, confirm parameters for use in fast running design tools, develop a robust and conservative design method for specifying high strength glass windows, and evaluate human injury due to high strength glass. PPG Industries provided all Herculite XP glass and IGUs, while Physical Security provided window frames and glazed and installed all windows during the dynamic tests. We performed eight quasi-static tests at the PEC glass test facility in Austin, Texas to confirm Herculite® XP glass material properties (previous static testing had been performed in 2010). Testing was performed using PEC’s static test tank during December 2011 and January 2012. The tank uses water to apply a uniform load on the glass, such that load deformation relationships can be measured. 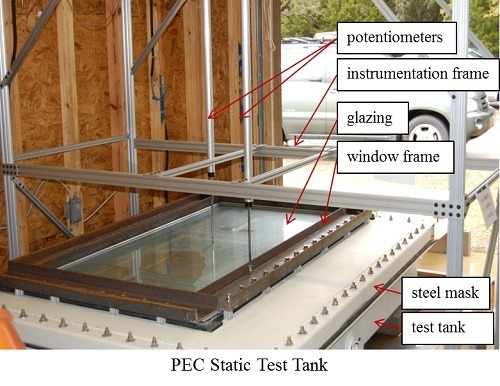 Window specimens with four monolithic glass thicknesses were constructed, mounted on the test tanks, and subjected to quasi-static loads to generate static load deflection curves (resistance functions) and to determine appropriated surface flaw parameters for use in predictive equations. The test results were consistent with the 2010 test results and were used to make predictions for the dynamic shock tube tests. PEC performed 21 shock tube tests at the ABS facility in Bulverde, Texas during April of 2012. The goal of the shock tube testing was to evaluate the performance of Herculite® XP glass subjected to dynamic loads (to evaluate performance including rate effects), single-degree-of-freedom (SDOF) predictive tools for glass response (maximum deflections), and human injury level (shard size and velocities). Testing was conducted with the ABS shock tube. ABS provided a window support frame to reduce the shock tube opening and to provide connection points for both types of window frames. Instrumentation used during the shock tube tests included pressure gauges, laser deflection gauges, high-speed video cameras, and digital image correlation (DIC). ABS collected and processed all data except DIC which was processed by AFRL and shard velocity data which was processed by PEC. 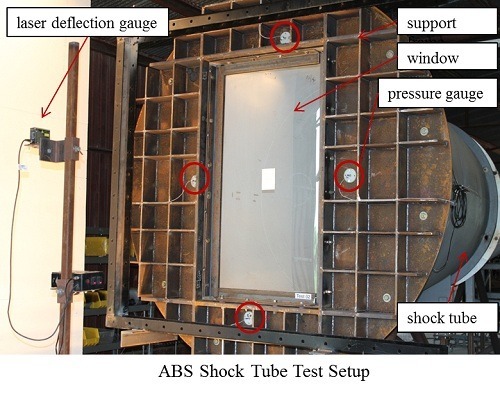 The shock tube testing provided an abundance of data with regard to window deformed shape, debris fly-out, crack propagation, glass deflection at failure, and PVB bite considerations. Overall, sufficient data was collected to incorporate dynamic effects in the SDOF predictive tools (specifically, SBEDS-W) and make predictions for the blast tests. PEC also performed a coupled analysis of the glazing and mullions prior to blast testing to account for the influence of flexible supports using LS-DYNA. 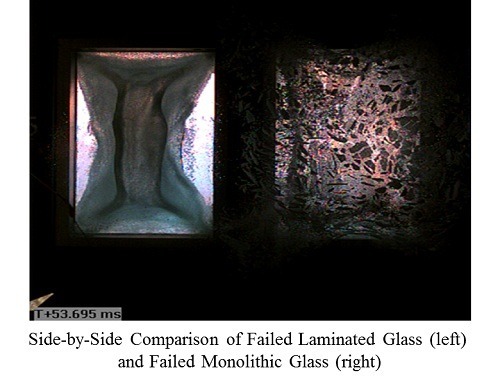 Glass response was observed and measured in the shock tube tests described above and in the blast tests described below using a novel video imaging technique called digital image correlation (DIC). This technique uses high speed stereographic video imaging of the glass surface. These video streams are then processed using software provided by Correlated Solutions to extract 3-dimensional response information. 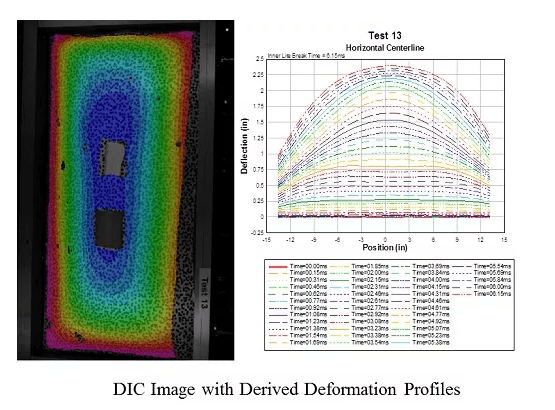 The technique facilitates real time deformed shape determination as well as a qualitative determination of surface strain. 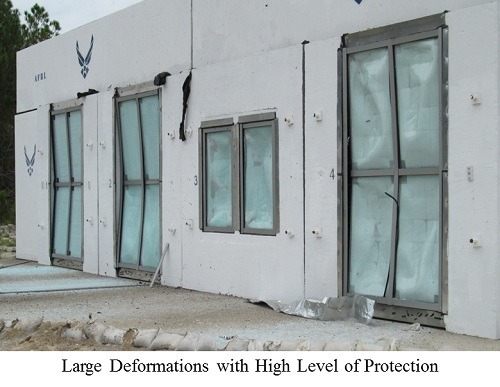 To validate the improved predictive capabilities resulting from the static and shock tube test data, two full-scale blast tests were performed on twelve window assemblies at the AFRL test facilities located on Tyndall Air Force Base in Panama City, Florida. Test 1 was performed on August 22, 2012 and Test 2 was performed on October 3, 2012. Both tests were performed to validate the performance of Herculite® XP IGUs in punched window and storefront configurations using commercially available window frames. Instrumentation during each blast test included pressure gauges, deflection gauges, DIC measurements, shard velocity measurements, temperature measurements, soft-catch systems for glass shards, and high-speed video cameras. Results were used to evaluate the overall system performance of the glazing and mullions and human injury levels due to glass hazards from overloaded Herculite® XP windows. In general, Herculite® XP glazing in unreinforced commercial mullions performed very well when subjected to blast loads. A maximum midspan deflection of 11.2 inches (or a support rotation of 11.4 degrees) was measured while still providing a high level of protection (no debris inside the room). The design parameters developed through analysis and model improvement result in robust resistance functions for dynamic (SDOF) analysis of Herculite® XP. The SDOF analysis tool conservatively predicts the performance of Herculite® XP IGUs in standard layups subjected to blast loads. Tests illustrate that commercial mullion systems can successfully support Herculite® XP glass when subjected to blast loads. Blast tests also illustrate that for blast loads in many standoff scenarios, the glass and mullion response can be considered uncoupled and designed using SDOF analysis. A coupled analysis may be more appropriate for more complex curtain wall systems with varying support conditions. The data collected will help validate future multi-degree-of-freedom (MDOF) design tools of glass and mullion systems. Herculite® XP glass can be incorporated into existing industry standards, such as ASTM E1300 (2012), using an approach outlined by the ASTM task group with minor modifications. Data collected during the test programs was used to adjust the approach specifically for Herculite® XP applications. Finally, Herculite® XP can provide the same or higher levels of protection as annealed (AN), heat strengthened (HS), or FT glass using thinner and lighter (less expensive) sections. The potential for human injuries due to overloading of IGUs with monolithic and laminated Herculite® XP was determined in the tests by calculating Abbreviated Injury Scores (AIS) and Injury Severity Scores (ISS) using the Multi-Hit Glass Penetration (MHGP) code. When subject to a blast overload, monolithic Herculite® XP poses slightly less of a hazard than monolithic AN or FT glass. It was also determined that, again in an overload situation, Herculite® XP creates slightly less of a hazard than laminated Herculite® XP while maintaining a similar level of protection. Contact any of the PEC project team members for more information.